Ichthyosaurs were a very successful group of marine reptiles. 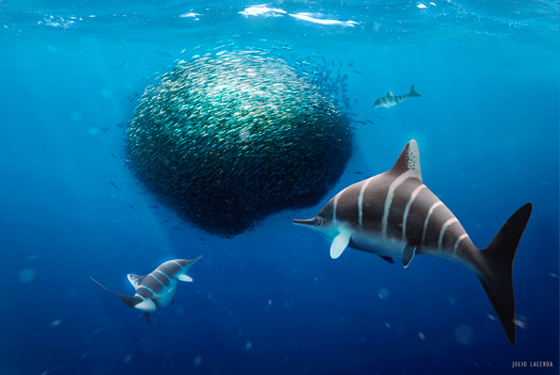 They originated during the Triassic and thrived in the seas of the Mesozoic and had a global distribution, but towards the end of the Cretaceous, these dolphin-shaped animals, that seemed so perfectly adapted to their environment, became extinct. They were the first, large extinct reptiles brought to the attention of the scientific world. It is difficult to avoid mention of the Ichthyosaurs when looking at information that outlines the history of palaeontology, however, despite first having been described nearly 200 years ago, (1821), there is still a lot we don’t know about these iconic “fish lizards”. It is the long history of scientific study and research into the Ichthyosaurs that has proved to be a bit of a headache for today’s palaeontologists. Dean Lomax, a palaeontologist and Honorary Scientist at The University of Manchester, working with Professor Judy Massare of Brockport College, New York, have studied thousands of Ichthyosaur specimens and have delved through hundreds of years of records to solve an ancient mystery, a mystery that dates back to the early 1820’2, when the English geologist William Conybeare, described the first species of Ichthyosaurus. Many Ichthyosaur fossils were found in England during the early 19th century, but it was not until 1821 that the first Ichthyosaur species was described called Ichthyosaurus communis. This species has become one of the most well-known and iconic of all the British fossil reptiles, after all, an Ichthyosaurus even featured on a set of specially commissioned Royal Mail stamps to celebrate 150 years of British palaeontology! In 1822, three other species of Ichthyosaurus were described, based on differences in the shape and structure of their teeth. Two of the species were later re-identified as other types of Ichthyosaur, whereas one of these species, called Ichthyosaurus intermedius, was still considered closely related to I. communis. In the years that followed, many eminent scientists, including Sir Richard Owen (the man who coined the word dinosaur), studied “fish lizard” fossils collected from Dorset, Somerset, Yorkshire and other locations in England. Their studies and observations of Ichthyosaurus communis and I. intermedius resulted in confusion with the species, with many skeletons identified on unreliable grounds. In the mid-1970’s, palaeontologist, Dr Chris McGowan was the first to suggest that Ichthyosaurus communis and I. intermedius may represent the same species. He could not find reliable evidence to separate the two species. Subsequent studies argued for and against the separation of the species. In this new research, Dean and Judy have reviewed all of the research for and against the separation of the two species. This is the most extensive scientific study ever published comparing the two Jurassic-aged marine reptiles. The pair of scientists have confirmed that the species are the same and that features of Ichthyosaurus intermedius can be found in other Ichthyosaur species, including I. communis. It seems that the fossil material ascribed to the species Ichthyosaurus intermedius lack any autapomorphies – distinctive features or derived characteristics and traits that are unique to that taxon. Thanks to the efforts of these two researchers, a fishy tale that is over a hundred years may have been resolved. The research has been published in Journal of Systematic Palaeontology: http://dx.doi.org/10.1080/14772019.2017.1291116. An interesting article, well done to Dean and Judy, their hard work has resulted in a better understanding of the Ichthyosaurus genus. I just found this blog on Pinterest, and am enjoying it. Dinosaurs et al were my first science loves, and I’ll always have a special place in my heart for them. Good article.